Last week I moved house. It all happened very fast. Decision and move all completed in just under a week! In truth I have a tendency to be spontaneous (ask my husband!) but the house move was well timed (and perhaps essential) because we’d outgrown our first home. And so too with your leaflet advertising. You were probably really happy with your leaflet when you first created it. But no doubt your business has evolved since then. Perhaps you’ve gained more experience, have a clearer idea of what works, or realised you could word your message that bit smarter. Your headline is always the most important words you write when advertising. That’s because whilst 8 out of 10 people will read your headline, only 2 out of 10 people will read the rest. And that means if your headline fails to bite, the rest of your message is lost. Hone in on your biggest benefit. Focuses on something that really matters to your target audience. Builds desire to discover more. So don’t just settle for the first idea that pops into your mind. Your headline deserves more attention that that. Instead brainstorm ideas and take the time needed to ensure you opt for the right opening. It will make the difference between a success and a flop. Topical events can provide a great hook for your leaflet advertising. For example the summer Olympics offered a great opportunity (within tight restictions) to be creative with your advertising message. However when using this tactic you need to be careful you don’t get carried away. Any link to a topical event supports, not buries your message. The link isn’t so vague it leaves your target audience confused about the offer. It’s still clear what your leaflet is about (for example serviced offices, not a sports event). In short don’t lose yourself in your attempt to piggyback off a current event. Instead only use it if you’re clear the connection will resonate with your target audience and attract more attention than you could have achieved without it. Your call to action is copywriting jargon for what you want readers to do next? Every piece of persuasive writing MUST have a call to action. Skip it and you’ll leave your audience hanging and miss out on sales. “But it’s obvious” I hear you cry. And here you’ll be right. But it’s obvious to you because you know your business inside out and upside down. However it’s not obvious to a reader who may have simply glanced at your leaflet and half-heartedly scanned your offer. To download your free copy of Inspire Your Way To A Successful Micro Business click here. If you liked this blog post, please retweet. And one final thing. Stick to just one call to action. If you give people too many options they are more likely to do nothing. If you offer professional services and you have accreditation from a professional body, it’s worth including in your leaflet. Similarly, if you offer beauty treatments, massage therapy or coaching make it clear you hold the appropriate qualifications. In fact, whatever your business, if you have third party validation that builds credibility for what you offer, showcase it. Do this and it will help address readers objections and start building that all important trust. Testimonials can also work well for achieving this. Why should I pick you over everyone else? In truth that’s all customers want to know. And if you can’t answer these questions you’re going to struggle to attract attention and capture the interest. The answer will often be found in your Unique Selling Point. And whilst tempting, don’t make the mistake of making your advert all about price. You see, if price is the only thing you can compete on beware, someone can (and will) always undercut you. Instead focus on the aspect of your business that only you provide, then craft a message that attracts customers based on that. A common mistake is to focus on features in your advertising. On the surface it makes sense – after all you’re telling customers what they are going to get. However people rarely make buying decisions based on need (apart from the essentials of course). Instead we buy because we want. And it’s product / service benefits which elicit the emotions that draw out the “I need that now” feeling. To achieve that you need to work out how your product or service enhances your customers’ lives. If you make black-out blinds you’re selling parents a good night sleep. If you offer website critiques you’re selling the opportunity to attract more customers and make more sales. Through your ebook you provide a route to more knowledge and success. Take some time out to work out what you are really selling? And then weave that into your sales message. Unfortunately customers are not that interested in what you think. But they are very interested in what they have to gain or how they will benefit from what you do. A really easy way to supercharge your leaflet is to shift the emphasis. Instead of “we do this” and “we offer that”, appeal directly to your customer and use the word YOU. You’ll be amazed how this will influence your response rate. When you’re creating your leaflet advertising you must ensure you stand in your customers’ shoes. If you don’t you risk missing out something critical they need to read to make their buying decision. If you have a clinic where you offer treatments include the address. If your leaflet is promoting serviced offices tell clients where they are located. If you want customers to get in touch, include contact details. And always include your web address (if you have one) as it allows customers to check you out. Remember. It’s easy to overlook something about your own business because you know it so well. It’s always worth asking a trusted eye to cast fresh eyes before you go to print to identify anything you may have missed. You’ll double the chances of getting your message read. Include a map and / or directions to make it super easy to find you. Include a case study to show how you have helped a specific (typical) customer. Write a top tips article – if it’s useful, your reader is more likely to hang on to your advertising. 10. Get your words right! OK I would say that, I’m a copywriter after all! But joking aside the words you choose to present your sales message are critical. In fact they can make the difference between a customer enquiry and the recycle bin. And it’s not just about the words you use. When creating your leaflet copy, there are a lot of aspects you need to consider to ensure your leaflet sells. Well done Georgina, some great tips again for writing effective leaflets and wow moving house in a week! Great post about the effectiveness of leaflet advertising. Great tips – I’ve often gone straight to computer instead of planning it out first too, but I think from now on I will do a little planning beforehand – it will probably save time in the long run. Thank you was really useful and clear to understand. Once again thank you for the tips. Some great tips here, nicely put. Can i share this tips for designing leaflet to all who ask me for help? Very helpfull !!!!! And belive me if I making this comment it means you impressed me! It is not easy, to do that! That’s very kind of you and I’m glad you found this helpful. Good luck with your leaflet marketing. Thanks for the beautifully written script . loved it . will be looking for more..
Great stuff Nishant. 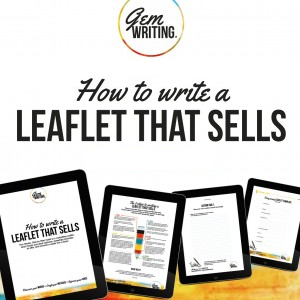 Hopefully you’ve discovered some tips to make it easier for you to write your next leaflet. I’m writing a leaflet to encourage bequests to a local charity. Some of your tips are therefore not applicable. Do you have any specific tips? Hi Ian. Even if it’s a charity, the elements are still the same. You still need the hook and the story and you still need a deadline and the call to action (you may even have an offer – donate this and get this). I think for a charity the key thing is to find the emotional connection. You need to move people so that they almost feel guilty if they do nothing. Stories are exceptionally good for this because instead of talking about a group of people (or whoever the charity supports), you make it about one person – and down well, you make the audience connect and feel empathy with that individual. Just think about how brilliantly the big events such as Comic Relief (if you’re in the UK) does this through their videos. Stories are so powerful so I’d be starting with that. I hope that helps. this article help me so much ! i love it ! it really useful and easy to understand. thank you for making this ! Excellent advice, thank you. We will use it for marketing. 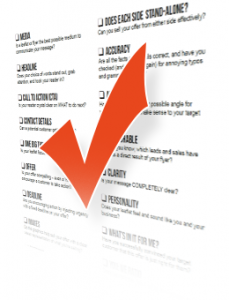 Thank you Georgina, I found the 10 point check list really easy to follow and am using it now to put together my first leaflet as a sole trader.